News that a Texas city is to be powered by 100% renewable energy sparked surprise in an oil-obsessed, Republican-dominated state where fossil fuels are king and climate change activists were described as “the equivalent of the flat-earthers” by US senator and GOP presidential hopeful Ted Cruz. “I was called an Al Gore clone, a tree-hugger,” says Jim Briggs, interim city manager of Georgetown, a community of about 50,000 people some 25 miles north of Austin. Briggs, who was a key player in Georgetown’s decision to become the first city in the Lone Star State to be powered by 100% renewable energy, has worked for the city for 30 years. He wears a belt with shiny silver decorations and a gold ring with a lone star motif, and is keen to point out that he is not some kind of California-style eco-warrior with a liberal agenda. In fact, he is a staunchly Texan pragmatist. In many Texas cities the electricity market is deregulated, meaning that customers choose from a dizzying variety of providers and plans. In Houston, for example, there are more than 70 plans that offer energy from entirely renewable sources. That makes it easy to switch, so in a dynamic marketplace, providers tend to focus on the immediate future. This discourages the creation of renewable energy facilities, which require long-term investment to be viable. But in Georgetown, the city utility company has a monopoly. When its staff examined their options last year, they discovered something that seemed remarkable, especially in Texas: renewable energy was cheaper than non-renewable. And so last month city officials finalised a deal with SunEdison, a giant multinational solar energy company. It means that by January 2017, all electricity within the city’s service area will come from wind and solar power. In 2014, the city signed a 20-year agreement with EDF for wind power from a forthcoming project near Amarillo. Taking the renewable elements up to 100%, SunEdison will build plants in west Texas that will provide Georgetown with 150 megawatts of solar power in a deal running from 2016 or 2017 to 2041. With consistent and reliable production the goal, the combination takes into account that wind farms generate most of their energy in the evenings, after the sun has set. Despite its proximity to the left-leaning Austin, Georgetown is not instinctively progressive. Its main selling point is the old-school charm of its historic core, which credibly bills itself as the Most Beautiful Town Square In Texas. It is not a natural political companion to Burlington, a similar-sized city in liberal Vermont that last year reportedly became the first in the US to use 100% renewable energy. Though Georgetown is home to Southwestern University, a liberal arts college, Briggs said that more than 40% of residents are over 50. The area is conservative and much of the positive reaction to the announcement has come less because the citizens are desperate to help the planet than because they are getting the security of a fixed rate plan that will be similar to the current cost of about 9.6 cents per kilowatt-hour and will protect them against the impact of fluctuations in the price of fossil fuels. He said that for manufacturing companies conscious of their carbon footprint, basing themselves in a place that offers 100% wind and solar energy would be an easy way to boost their green credentials. In a state that loves to bash Washington, what little criticism there has been, Briggs said, has stemmed from the federal tax breaks handed out to encourage renewable energy. “Well then, we should never have mass transit and quit farming … that argument, while it’s there, is really pretty shallow,” he says. Fearing an imminent end to the government’s generosity, private green energy companies have scrambled to build facilities. At the same time, in recent years a glut of Chinese-made panels has made solar power more cost-effective. And while west Texas is an oil driller’s paradise, it is also sunny and gusty, making it a perfect corridor for renewable energy. The region bordering New Mexico is one of the prime solar resource sites in the US and the wind whistles across the plains to such an extent that, as Scientific American pointed out last year, the state is America’s largest wind power producer – as well as leading the nation in the production of crude oil and the emission of greenhouse gases. Renewable energy also uses much less water than traditional power generation – a bonus in a state where half the land and more than nine million people are affected by drought conditions, though Briggs said that for Georgetown, water conservation was only a “side benefit”. Greg Abbott, formerly Texas attorney general and now governor, repeatedly sued the federal government over its attempts to regulate greenhouse gas emissions. Last year, the chairman of the Texas Commission on Environmental Quality, Bryan Shaw, said there is a “lack of links between greenhouse gases and the climate”. Shaw was appointed by former governor Rick Perry, a notorious climate-change sceptic and a prospective Republican White House candidate for 2016. 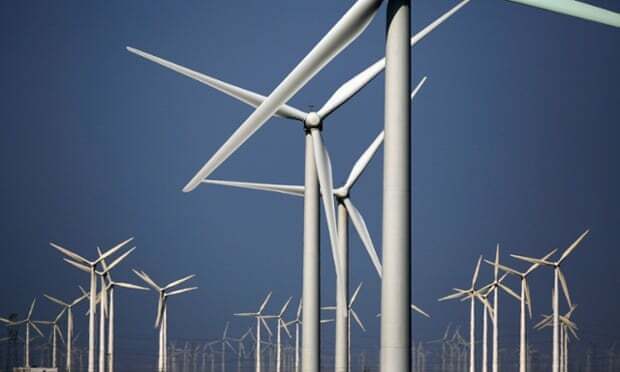 Yet amid the rhetoric, denial and promotion of corporate interests and economic prosperity ahead of environmental concerns, over the past decade Texas lawmakers authorised the spending of $7bn of taxpayers’ money on the Competitive Renewable Energy Zone, a vast infrastructure project to connect west Texas wind power to major urban areas. So Texas has the weather, the infrastructure and – certainly in small places such as Georgetown – the current market conditions to be greener. But a state report last September cast a cloud over the future of renewable energy in Texas, saying it was not reliable or extensive enough to meet peak demand. “Renewables need conventional power backup,” it said. Fred Beach, assistant director for policy studies at the University of Texas at Austin’s Energy Institute, said that “at the moment, unfortunately, the legislature is pretty clueless when it comes to renewables” and is failing to get the most out of their investment. Beach suspects that Big Oil will fret that Georgetown’s pioneering move is the start of a trend, and polluting, inefficient coal power plants will be pushed out of service by more deployment of wind and solar energy. But he believes that would likely prove good news for natural gas generators, who will be relied upon in the scorching summer months when demand is highest. Ultimately, he said, in a practical-minded place like Texas, the best way to encourage the use of green energy is to appeal to heads rather than hearts and make a strong business case, as happened in Georgetown. Russ Dickson, co-owner of an antiques shop on the main square, said he was delighted at the move. “This is a pretty conservative community and to see a conservative community step up [and do this] makes me feel good about the future,” the 61-year-old said. Outside, Jon Klopf, a barber, sat on a bench enjoying a splendidly sunny Thursday afternoon. “They were just looking out for the cheapest deal. That’s just business,” the 50-year-old said. “I don’t really think we should be relying too much on oil, even though they have to right now. That don’t last forever.